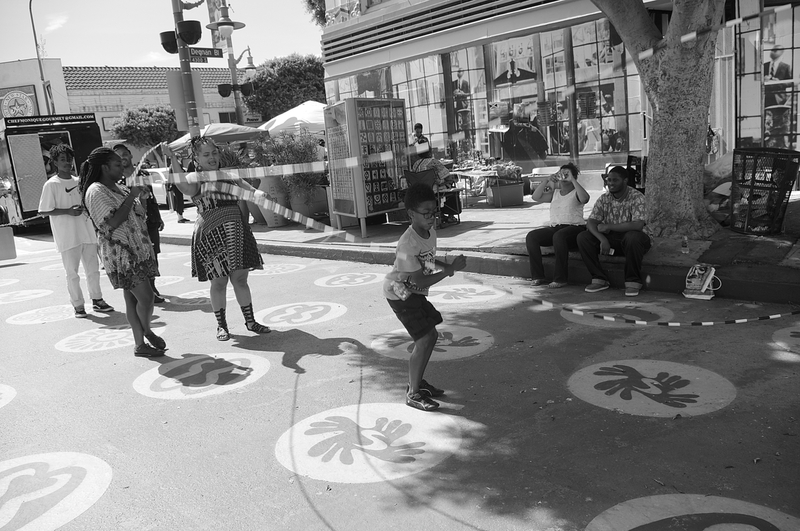 Leimert Park Village’s People St Plaza officially opened for business this past weekend. 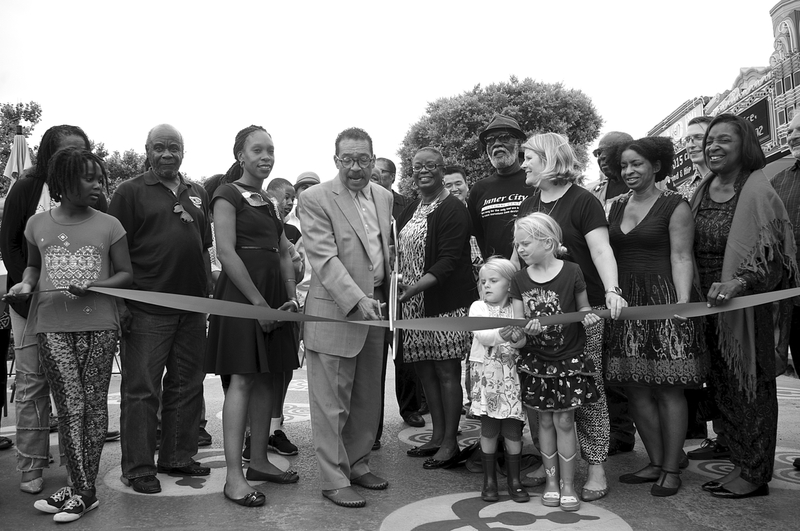 Sahra Sulaiman/Streetsblog L.A.
“Don’t tell anybody I’m using these,” Councilmember Herb Wesson said of the blue art scissors he wielded as the moment came to cut the ribbon on Leimert Park Village’s People St Plaza project this past Saturday. The enormous pair of wooden scissors held by Institute for Maximum Human Potential President/CEO Delores Brown — the fiscal sponsor of the plaza project — were only ceremonial. The cutting of the ribbon on the People St Plaza. Councilmember Wesson is flanked by (l-r) Johnnie Raines, Empowerment Congress West (ECWA) member-at-large, ECWA Chair Danielle Lafayette, Institute for Maximum Human Potential President/CEO Delores Brown, Leimert Park Art Walk co-founder Ben Caldwell, LADOT GM Seleta Reynolds, Director of Special Projects for the Dept. of Cultural Affairs James Burks, Urban Design Center founder Sherri Franklin, Manager/Program Director of Great Streets, Nat Gale, and Metro Boardmember Jackie Dupont-Walker. Sahra Sulaiman/Streetsblog L.A. 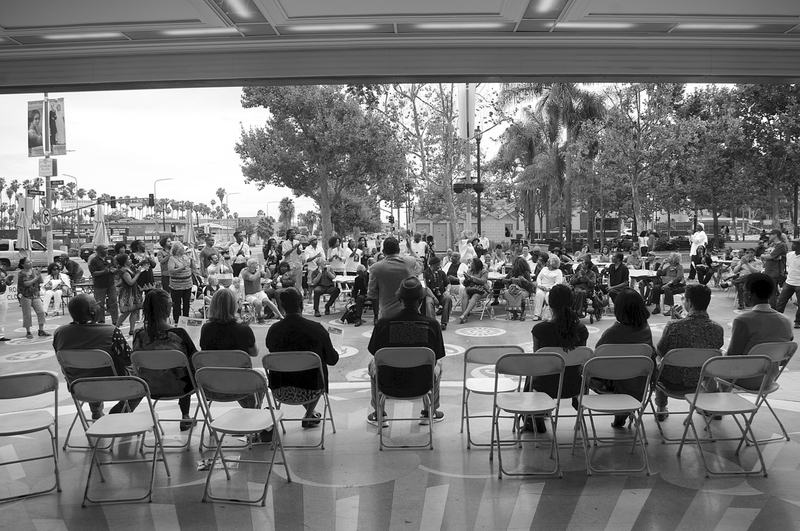 The ribbon-cutting marked the end of the first stage in a long process for Leimert Park Village stakeholders. A year and a half prior, at the first community-wide design charette, they had talked about the possibility of converting part of 43rd Pl. into a plaza space. With the Leimert Park Metro station due to be finished in the next few years, they had felt the time for deciding what face they wanted to present to the world was now. Situated directly in front of the beautiful Vision Theater, the KAOS Network, and part of Mark Bradford’s Art + Practice campus, the site looked to be the perfect anchor for the rebranding of the community as a hub for black creatives and the celebration of the African diaspora. 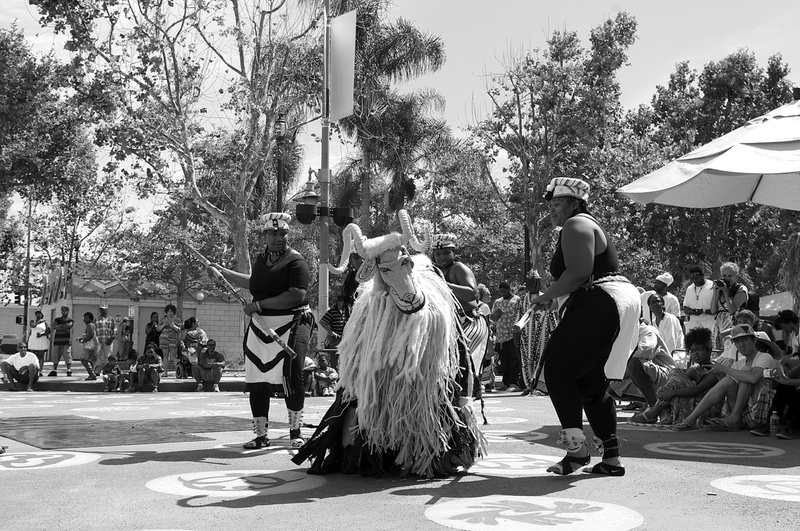 The Sankofa bird is a symbol of the art walk and has come to be central to the image of Leimert Park Village. Sahra Sulaiman/Streetsblog L.A.
Over the next year, stakeholders met on a weekly basis to advance the objectives defined in that first charette. Settling upon a design for the plaza (with invaluable assistance from the team at Kendall Planning + Design) and figuring out how to mold the city template to fit into their rebranding effort were some of their regular topics. Not thrilled with the idea of polka dots (part of the plaza template), they decided to fill the dots with cocoa-colored Adinkra symbols. These symbols of the Akan people, an ethnic group in Ghana, were once only seen on cloths worn by community leaders during special occasions. More widely worn now, they still retain their meaning and represent proverbs, depict historical events, or offer some truth about human behavior or the world as the Akan people understood it. The Sankofa symbol (above), for example, depicting a bird reaching backwards to retrieve something it left behind, is meant to communicate the importance of carrying lessons from the past forward in order to build a better future. 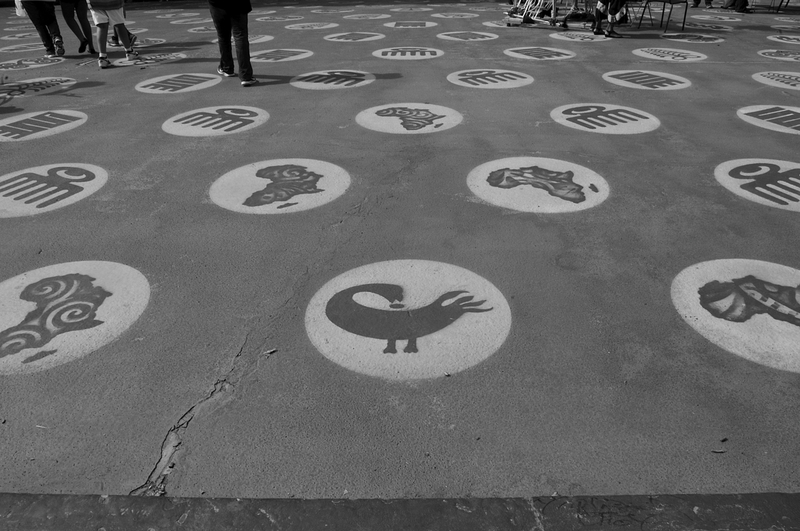 A guide to the Adinkra symbols found on the plaza. Sahra Sulaiman/Streetsblog L.A. 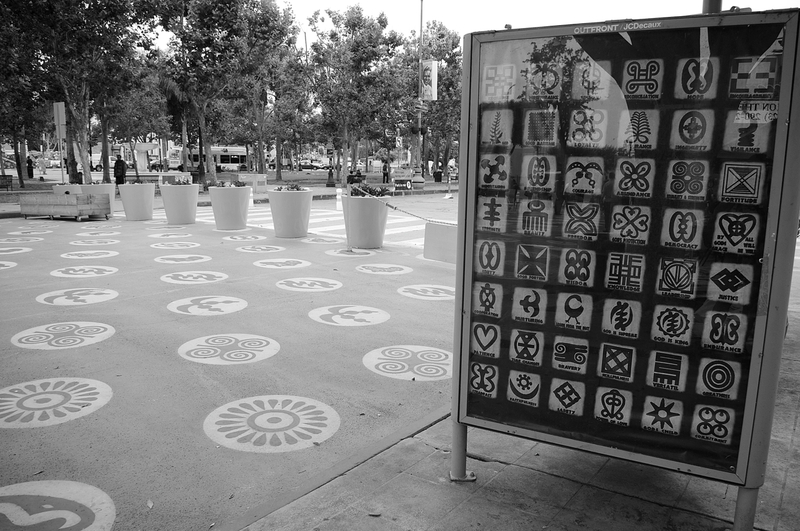 Together, the values and ideas the symbols promote, stakeholders felt, could be used to help guide programming in the plaza, incorporated into educational materials, and used throughout the Village area to reinforce the notion that when you enter Leimert Park, you are entering a unique space that is home to a population with a unique cultural heritage. That space is still very much in the process of being defined. The plaza celebrations Saturday afternoon marked the closing of the 2nd Annual 20/20 Vision Initiative Design Charette, during which a variety of topics, including the importance of linking transportation gains to economic growth and the fate of the two parking lots in the Village area were debated (below). Stakeholders discuss what they would like to see replace the parking lots in the Village area. Sahra Sulaiman/Streetsblog L.A.
As it stands right now, stakeholders seem in favor of a cultural center being built behind the Vision Theater, off Degnan Blvd. The need for such a center is clear. 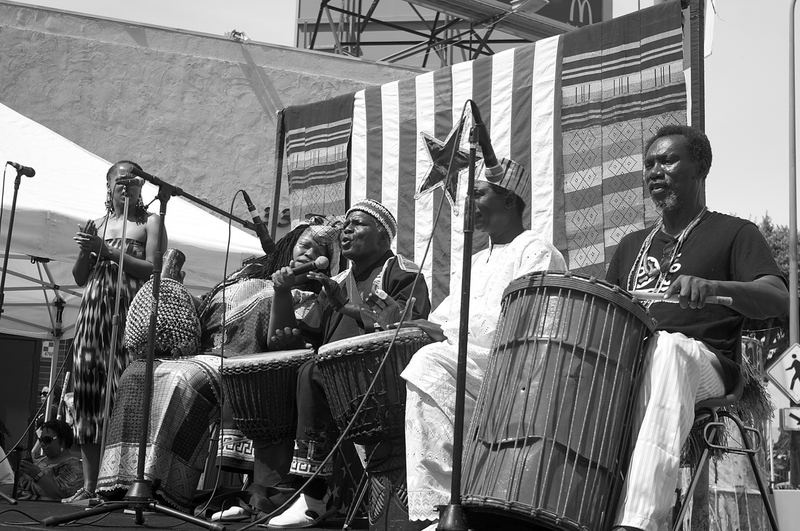 As of now, there is no central location where information on the evolution of what is considered to be the cultural beating heart of the black community can be found. But, as museums are generally not lucrative endeavors, stakeholders debated different ways to make such a site financially viable, including incorporating existing artists and workshops into the space, making it interactive, and having a restaurant or cafe in it. The other site, located between Crenshaw and Degnan, was thought to be a prime location for live/work lofts (to bring density and dollars to the Village), production and recording studios, a tech hub/creative work space, and/or a smattering of small retail shops. Defining it clearly now, he suggested, would help ensure the community would not be left behind as the train line neared completion and change took greater hold around the area. Councilmember Herb Wesson and local dignitaries celebrate the opening of the People St Plaza project. Sahra Sulaiman/Streetsblog L.A.
On Sunday, the day after the opening, it was clear just how important culture is to that vision. 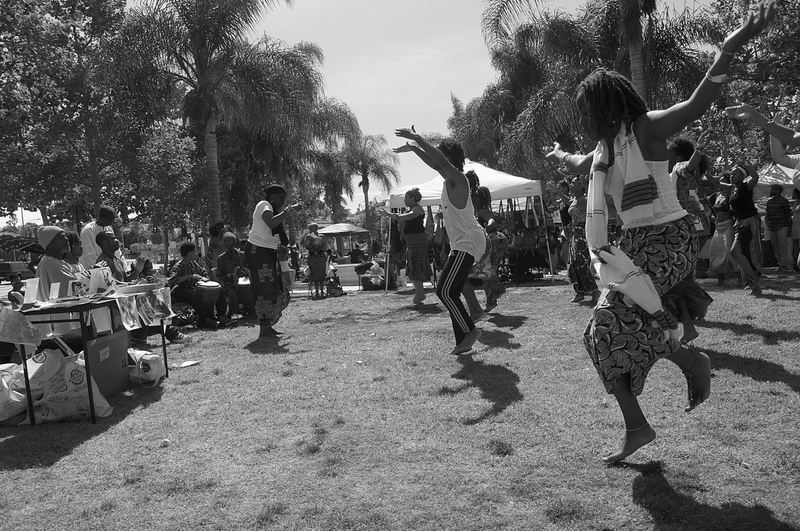 Honoring the ancestors with the annual Mask Festival and procession, the plaza was filled with colorful masks, dancing, singing, and reflection on what it meant to be part of the diaspora. 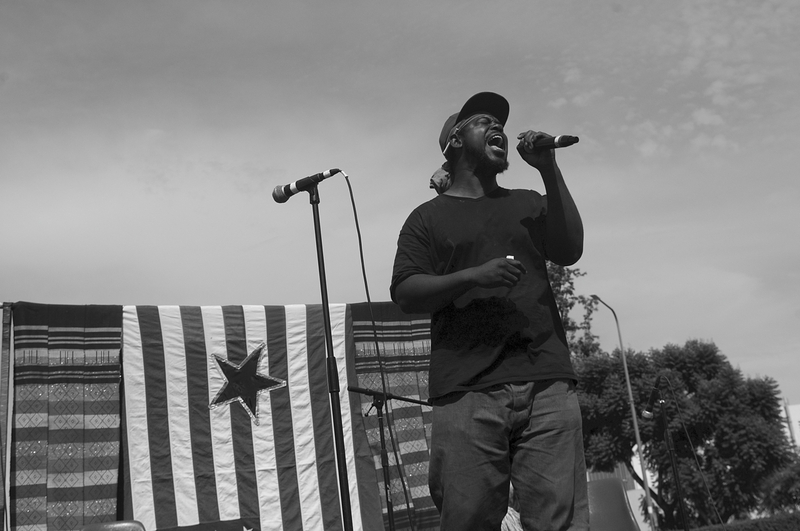 Music and dance filled the plaza during Sunday’s art walk and Mask Festival. 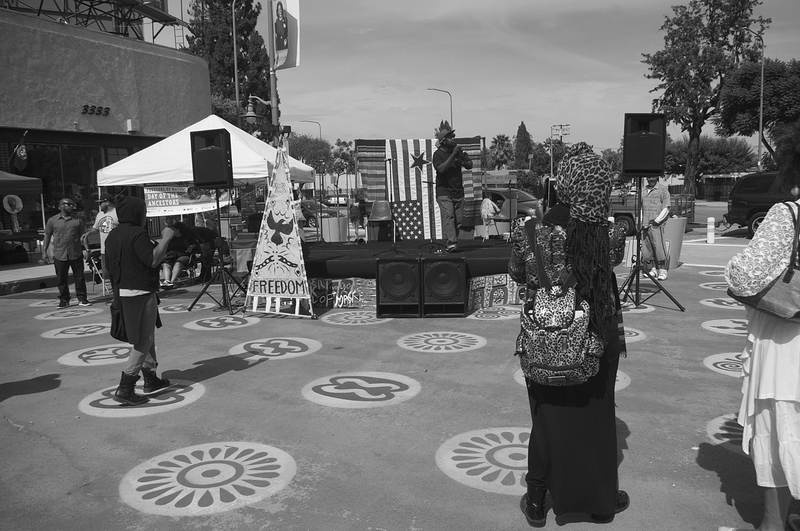 Sahra Sulaiman/Streetsblog L.A.
More photos from the weekend follow below. If you’d like to participate in the conversations around the future of the Village, please visit the LPV website and join them Monday mornings at 10 a.m. in the Vision Theater. 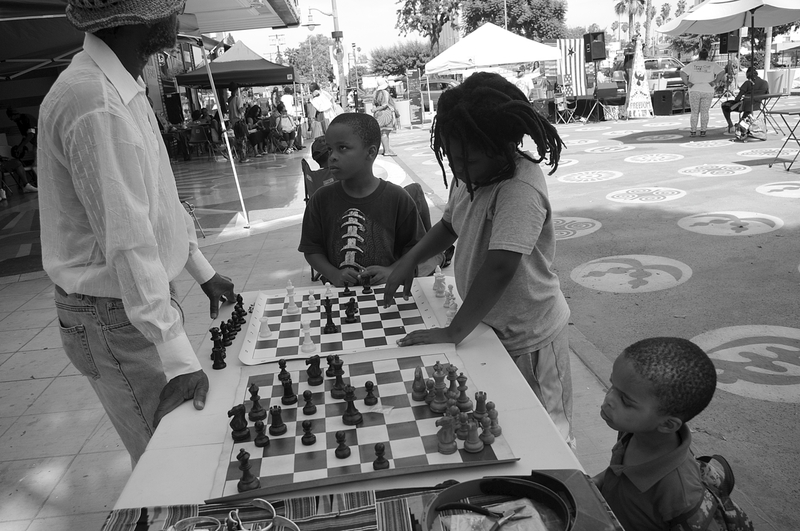 If you would like to take the Leimert Park Village stakeholders’ survey, please click here. Double dutch has become a staple on the plaza. Sahra Sulaiman/Streetsblog L.A. So has chess. 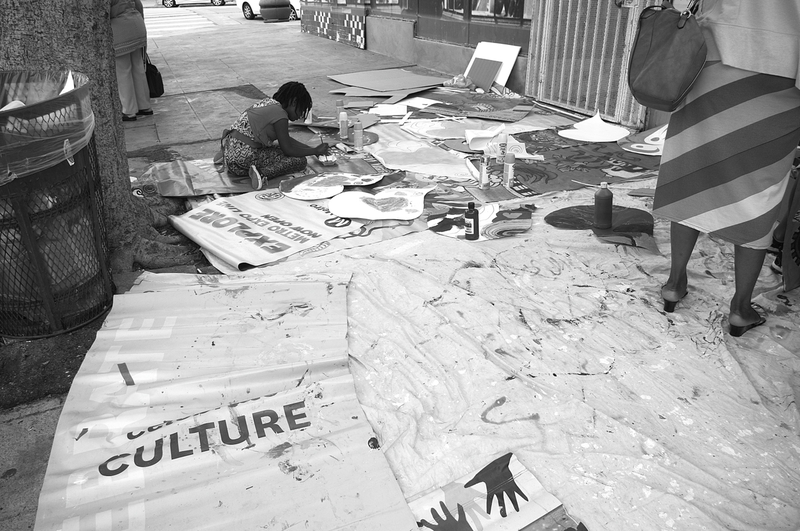 Sahra Sulaiman/Streetsblog L.A.
And art-making. 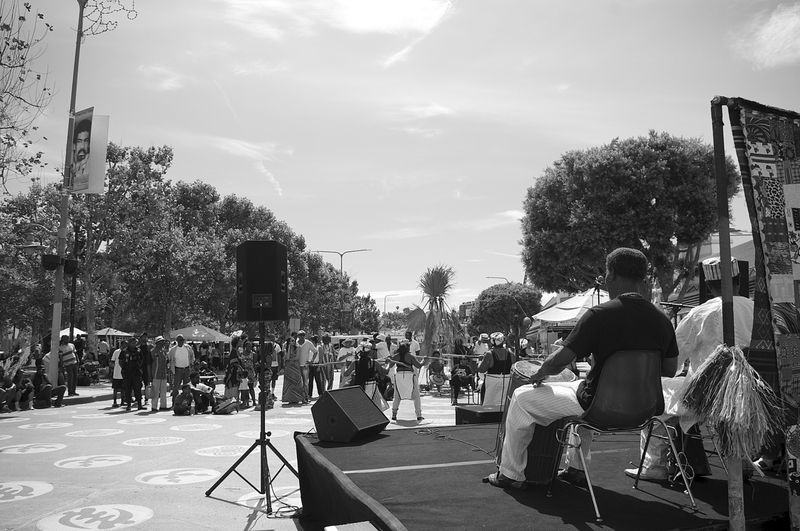 Sahra Sulaiman/Streetsblog L.A.
And good music. Sahra Sulaiman/Streetsblog L.A. The stage set-up. Sahra Sulaiman/Streetsblog L.A. Looking out over the plaza. Sahra Sulaiman/Streetsblog L.A.
Nice piece . . . in general I can live with your black and white photography, but this particular story really called out for color. it does. but my camera doesn’t do color all that well. and neither do i. but my plan is to upgrade this year so color can be used when it is called for. The streets in this neighborhood are an incredible waste of space. They should have shut down a lot more than this tiny patch. 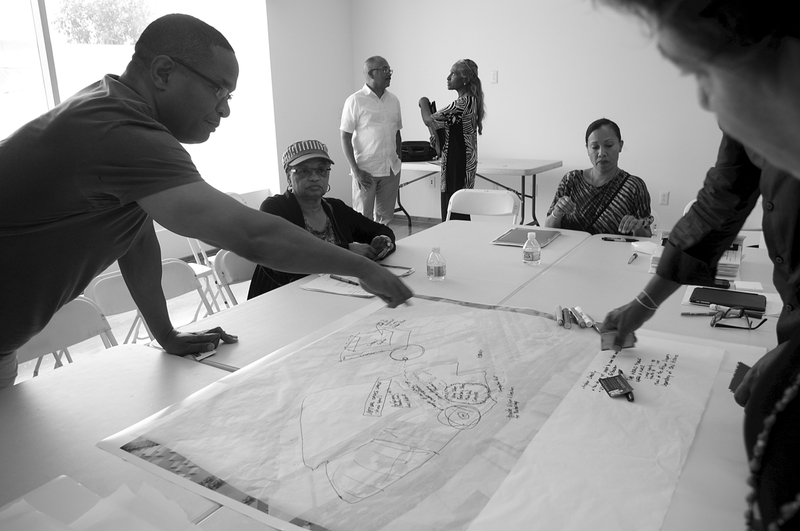 Launched in 2014, the 20/20 Vision Initiative was born out of the desire of area stakeholders to harness both the change and the opportunities expected to accompany the 2020 opening of the Crenshaw/LAX Line and the new Leimert Park station.